The new Konnext™ OneAdapter™ ChargerDual migrates all the great functions from our best selling OneAdapter™ Charger, with dual USB charging ports and 1 Ampere USB Charging power. Charge multiple devices with boarder compatiblity and more rapid charging in over 150 countries now with the new Konnext™ OneAdapter™ ChargerDual! Leave the chargers for your mobile phone, digital camera, iPod, PSP, MP3 Player, PDA etc... at home! And charge them with the Konnext™ OneAdapter™ ChargerDual built-in USB Charger. Be connected and protected! From Australia to Zimbabwe, the Konnext™ OneAdapter™ ChargerDual provides compatibility in over 150 countries worldwide. The built-in surges and spikes protection system protects your mobile electroncis from potential damage. 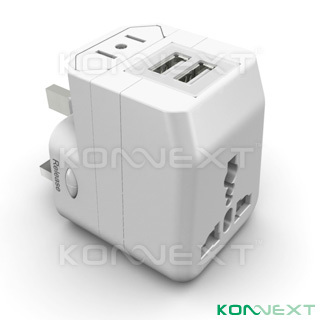 With the Konnext™ OneAdapter™ ChargerDual, you can power up your notebook computer through the AC power port and charge your mobile electronics through the USB power port simultaneously. Experience a more successful business trip and a more enjoyable vacation with less luagge and worries with the Konnext™ OneAdapter™ ChargerDual!